Newsletters will be emailed to parents and posted here. 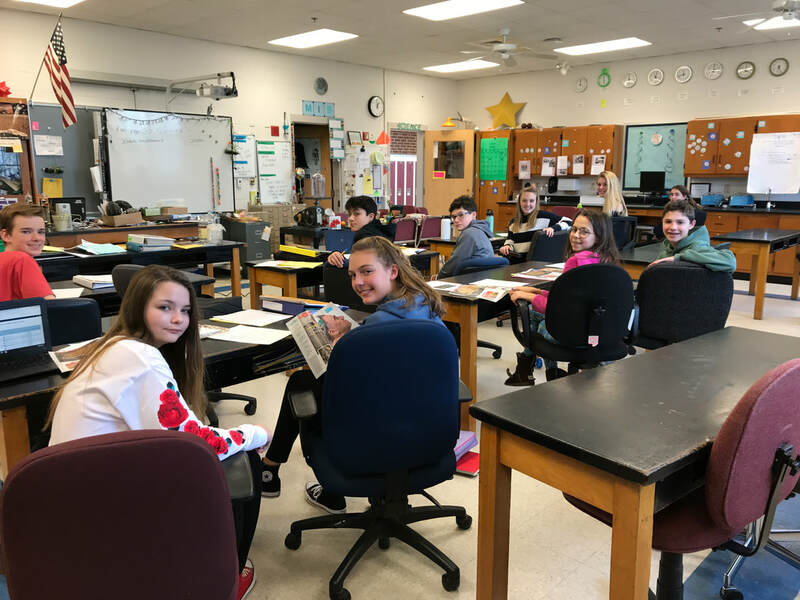 Thanks for reading our eighth grade January newsletter! Have a great weekend! Montreal calendars: All money and calendar slips are due by Monday, January 28. We will start picking winners on Friday, February 1! Grading reminder: Just a reminder that as we improve and work toward best practice in grading and reporting, teachers have adjusted what grades are added to PowerSchool. Only assessments and culminating work in which students have demonstrated knowledge of content will be recorded as a grade toward their final grade. Homework, classwork, and other ‘formative’ grades may be added to PowerSchool, but do not count toward the final grade. This way, students, parents, and teachers have a more accurate representation of what students know and are able to do with content knowledge. Green and Yellow Math - Students just completed their chapter 4 assessment on lines and linear equations using slope and y-intercept. Several students did not demonstrate solid understanding on this assessment. They are expected to complete the required Buzzmath assignments for re-learning and practice related to chapter 4 standards and test corrections to earn back half the credit. Students have opportunities for extra help and practice during WIN blocks on Mondays, Wednesdays, and/or Fridays; please encourage them to take advantage of this time! Please check your student’s Powerschool grades to see how they are doing so far in Term 2. We have started chapter 5 on solving systems of linear equations both algebraically and graphically! Just a reminder that students should be using WIN block as a time to ask questions and get extra help when needed. Blue Math - Students just completed their chapter 5 assessment on solving systems of linear equations both algebraically and graphically. They really enjoyed this chapter and asked great questions. Several students earned a 100 on the assessment! More students have also been completing the challenge problem of the week! We have recently started chapter 6 on functions. A reminder that I am available for extra help and practice during WIN blocks on Mondays, Wednesdays, and Fridays. Language Arts: Students are completing an argument writing project this month. They have completed research on a topic, and are working to organize their evidence in a compelling manner. We have worked on recognizing evidence and reasoning, identifying counter claims and how to refute that information, and using an emotional appeal as a conclusion. It should not be surprising that most students are quite interested in honing their argumentative skills, and have found topics to research that are truly important to them. Please ask your student what they are writing about! ​Students have been reading high interest nonfiction books this month, and will be using their new knowledge to design a website dedicated to the content of their book. It’s exciting to see them learn something new, and apply it in a manner that considers presentation, design, and writing skills! 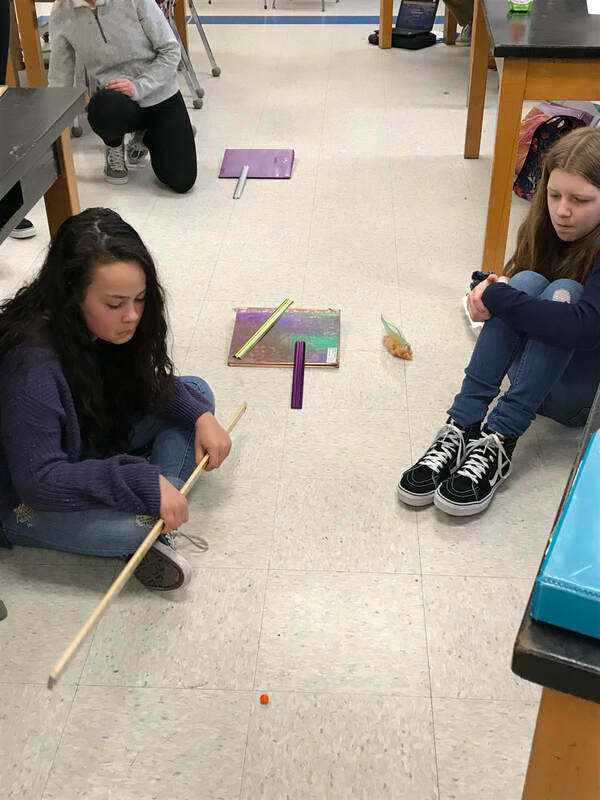 Science - The students are studying surfing, wind and ocean waves as a means of reviewing force and motion. This ties into the school-wide theme of power and the building of boogie boards and surfboards in STEAM. The students have been practicing writing CERs as conclusions for experiments and research. CER is a three part piece of writing that includes a claim, evidence (an example is data from an experiment) and reasoning that includes scientific knowledge. We are enjoying the new chairs in the classroom! We had a donation from one parent and several chairs from Northeast Credit Union. Everyone gets a wheeled chair which allows for movement and comfort especially for the taller students. Thank you!! Why do people (or governments) want to go to war when they know it will cause morally disastrous outcomes? Is war ever necessary, with its guaranteed consequences? To answer these questions, we will be examining World War I, World War II, the Holocaust, Japanese Internment in the US, the Korean Conflict, the Vietnam War, and the Cold War. Attention will be paid to cause and effect relationships between historical events, and students will be required to look at events through multiple lenses. For example, students recently used primary source documents to investigate who was responsible for the sinking of the Lusitania- and were quite surprised at the evidence they found. Harrington: We are focusing on the theme of ‘economics’ this trimester. We started by studying the roaring 20s and significant people of the Harlem Renaissance. Students completed a graphic novel on women’s suffrage. They learned about prohibition and organized crime. Then we focused on the economics of the Stock Market Crash of 1929 and the effects of the Great Depression. Students learned about FDR’s New Deal and had a structured academic controversy debate of whether it was a success or a failure. Currently students are completing a crime scene investigation on the Tulsa Race Riots and writing a Homeland Security report of their findings. Ms. Adams’ class has been investigating Progress in US history. We started with the definition of progress and discussed possible impacts of what we call progress. We made the connection of the telegraph and Rye! Did you know the underwater telegraph cable went from Rye to Nova Scotia, then Ireland? We will be examining how other inventions helped businesses progress, but not necessarily the lives of its workers. We will use primary source documents and learn how to analyze the reliability of the documents. It has been a great start to the school year and our eighth graders have demonstrated leadership and respectful behavior. Recently, students participated in a Financial Fair hosted by NECU, which was a huge success! Ask your child about their career, and the bills for which they were responsible. Cookie dough fundraiser: The RJH cookie dough fundraiser ends Wednesday, November 28, 2018. Please encourage your child to reach out to family and friends over the break to boost their sales! Montreal reminder: Please make sure you have visited the ACIS travel company online registration site in order to pay your deposit and register your eighth grader for our Montreal trip. All students brought home a Montreal informational packet a few weeks ago. If that has been misplaced, please ask your student to pick up another one at school. Project materials needed: Over break, please encourage your child to look for materials for their "A Christmas Carol" project. Depending on the group's plan, students may need paint, material, or other items. Please don't feel as though you need to buy anything- we want students to think about reusing and repurposing materials! Tuesday, December 4 from 8:30-11:30: Open Studios- visit your child's LA classroom to see how they are progressing in their technology project! 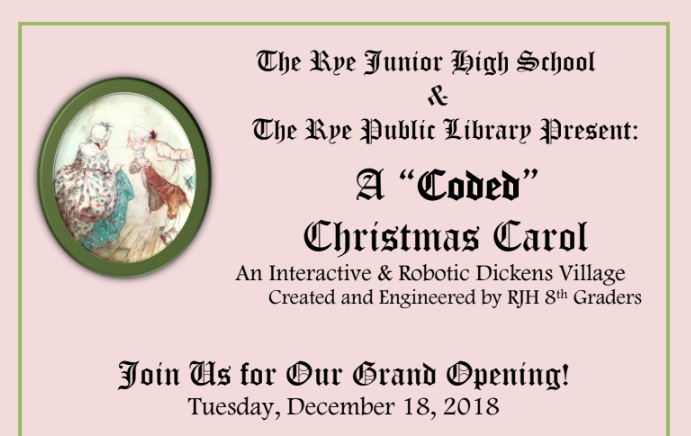 Wednesday, December 12 from 6:00-7:00: "A Christmas Carol" technology project unveiled - check out the eighth graders' culminating project that ties classic literature to current technology in order to bring the story to life. Friday, December 14: Eighth grade field trip to the North Shore Music Theater. The performance starts at 10:00, and students will be returning to school by 2:30. Tuesday, January 8, 2019: Portsmouth High School Step Up Day: Eighth grade students and teachers will spend the day at PHS. More information will be coming home at a later date. School supplies: Many students seem to be struggling to find pencils or other writing utensils. Please check in with your child to ensure that they have what they need at school. Montreal: It was great to see everyone at our Montreal informational meeting Friday night. If you were unable to attend, please ask your student to pick up an informational brochure from our travel company- the office has many extra copies. It will outline the payment process and provides key details regarding our trip in May. Thank you to our core group of parents who are willing to help with fundraising. Please contact a teacher if you would be willing to organize a fundraiser, or have a great idea! Computer reminder: Please help your student remember to charge their Chromebook each night, so they are ready to get to work during classes. Students cannot bring chargers to school, and must use a ‘loaner’ if they come to school without a charged computer. Right now, many students are forgetting to charge at night, and we would like to help them adjust to this expectation. Language Arts: Students have started reading “A Christmas Carol”, which is quite a challenge, even though most of them are familiar with the story. The language is tough, and the humorous references are lost on our 21st Century minds. However, the students are enjoying the story, and appear genuinely interested in the background of some of the language being used. Below, you will see some examples of the work students will be doing as we read “A Christmas Carol”. Students are charged with examining a specific scene, and pulling out key details. This task forces readers to look closely at the author’s message, and determine what those important details might be. One eighth grader reported to Ms. Soucy that they were “dissecting the text”, which is absolutely true (and made us all look brilliant, so thank you, student!) These details will be used in a culminating project, which you will be hearing more about as the year continues. In Blue class, students finished chapter 2 on scientific notation and did a great job. Students then reviewed solving multi-step equations from last year through a task card activity and then completed another fun “Math Lib!”. After the review, we began chapter 3 on Algebraic Linear Equations. Last Monday, your student should have come home and asked you the following question, “is 0.999… equivalent to 1?” They then should have proved it for you! On Friday, students completed their first fact fluency benchmark of the school year. In Green and Yellow class, students just wrapped up chapter 2 on scientific notation. Just a reminder that students should be studying their math notes, quizzes, and review problems from class prior to the chapter tests. BuzzMath assignments on the same topics are also available for extra practice. There is a relearning and test correction procedure for any students that would like to improve their test grade. They must follow all directions on the procedure sheet to earn up to half the points that were lost and have one week from the time the test is returned to complete them. Students have started reviewing solving multi-step equations from last year through a task card activity and will be completing another fun “Math Lib!” today. This will prepare them for chapter 3 on Algebraic Linear Equations. On Friday, students completed their first fact fluency benchmark of the school year. Thank you to those parents who were able to visit while the students were working on their power project. I think the students appreciated showing off how difficult the process can be and how they tacked some of their challenges. Each group was recorded and the videos will be available soon. Their reflections are going to be posted on SeeSaw. (If you do not have access or lost your login, please let me or Nina Keating, nkeating@sau50.org, know. This project was a prototype and platform to develop multiple science and social skills. This work will feed into a combined LA and Science project in the future. We are starting to get the miniboat ready. In class we are learning about heat transfer with conduction, convection and radiation which keeps the winds and waters moving on our Earth. The students will be working on how to assemble, decorate and deploy the boat. We need to launch it out passed the continental shelf. If any of you have some ideas about deployment, please let your child know. Mrs. Gilbert’s social studies class has begun looking into World War II, and how life on the US homefront changed because of the war. To begin, we researched the bombing at Pearl Harbor, and students created a collaborative news cast to report different viewpoints of the tragedy. Students examined how an eyewitness account differed from the President’s message. Next, we examined how citizens contributed to the war effort through rationing, recycling, and civil defense tactics. Finally, we will look into volunteerism during the war. To wrap up World War II, students will be examining the Holocaust and the lasting effects of that horrific time in history. Ms. Adams’ class has been investigating Progress in US history. When we discussed the Flu epidemic of 1918, we discussed vaccines. Janet Smith, our nurse, came in and discussed the epidemic and present day vaccines. As a follow-up, students made a chart of the difference between the cold and flu symptoms. (They were supposed to take this home. If you have not seen it, please ask them to print another copy.) The students also researched a vaccine and its effect on the disease and population. They were assessed through a graded discussion which also met some LA standards. 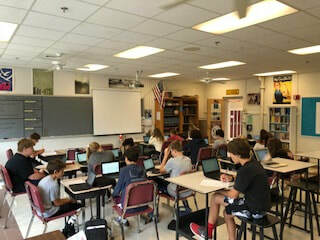 Mrs. Harrington’s social studies class learned about President Roosevelt’s Fireside Chats and the Dust Bowl. They also learned about FDR’s New Deal through a debate, social security, Fair Labor Standards Act, and minimum wage. Students did research and wrote excellent five paragraph essays with works cited on the Fair Labor Standards Act (FLSA). We then moved onto the 1950s and learned about the significance of the baby boomers and the growth of suburbia post WWII. We also discussed and read about stagflation and the oil crisis of 1970. Do you remember your parents having to alternate the days they could get gasoline based on their license plates ending in an even or odd number? Currently, we are learning about the economics during the presidency of Ronald Reagan. French students are learning everything they need to know to shop for clothing. Montreal: Save the date: Our Montreal trip dates have been finalized! We will be leaving Wednesday, May 29 at approximately 8:00 am, and returning Friday, May 31 around 7:00 pm. We are in the process of finalizing details with our travel company, ACIS. Their staff is working on a website for our trip that will be sent out to parents at a later date. We will send out information in the next few weeks about our first volunteer meeting. Thank you! Computer insurance: Deadline to renew the chromebook insurance for this year is September 30, which is Sunday!!! Please register here - https://gpo.worthavegroup.com/gpo/ryejunior Additional information was already sent to you in the earlier Friday emails. Students have wrapped up a collaborative writing assignment based on the summer read book Okay for Now. 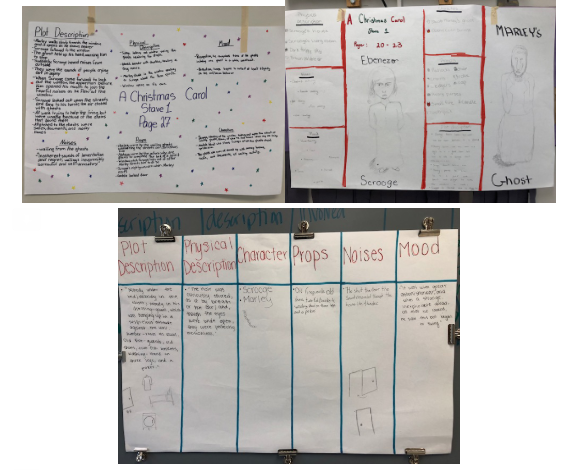 Using literary terms, students had a review of how stories are organized on a plot diagram, and reminded themselves about important terms like rising action, climax, falling action, theme, tone, and the difference between protagonist and antagonist. Using that organizational strategy, teams of students wrote a ‘Chapter 11’ of Okay for Now. These final chapters of the book will be posted on our pretend ‘fan fiction’ website, which is actually a Google Classroom specifically for that purpose. Ask your student if you can check them out on their account! The stories will also be posted on the student’s SeeSaw account. 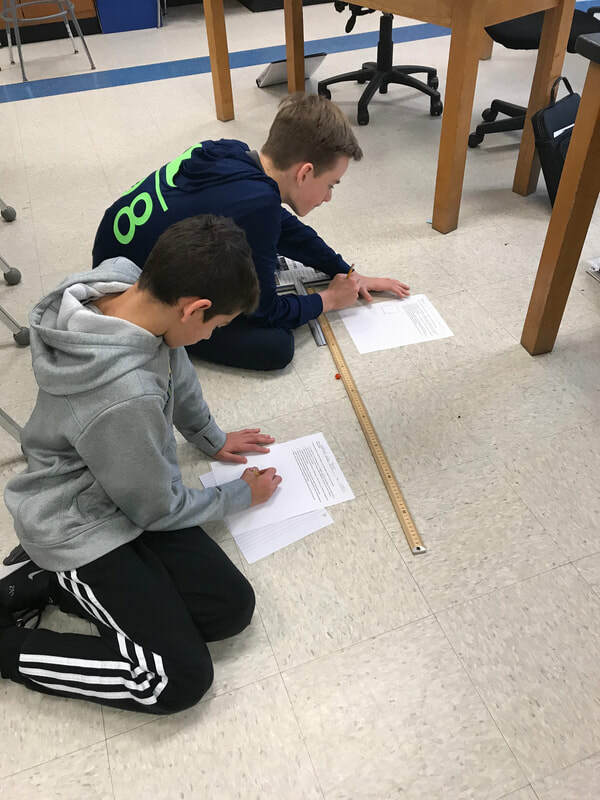 Note the photo of students revising and editing each others’ work- the focus and attention displayed their sense of responsibility toward the task! For the next few weeks, we will continue to work with literary devices as we read a few short stories and define those terms using the story’s content. Each story we read in class has a corresponding film, and students will be using details from each to answer the question “Why do directors make certain choices to change the story or keep it the same when adapting short stories into a film?” Students will have a writing assignment related to that question that will focus on organization, adding detail, and providing clear introductions and conclusions. Finally, students will be assessed on the definitions and application of the literary terms. As a reminder, each month every student is required to read a book. I have an extensive classroom library, our school library is phenomenal, and the public library has a wonderful teen room. It’s important to me that students feel positively about their reading, and aren’t overwhelmed or bored with their selections. I don’t require reading logs or other tracking methods, as the research shows that this detracts from a student’s enjoyment of reading. That being said, all students need a reminder once in a while- please ask periodically what they are reading, and what our ‘Reader’s Response” project is each month. Finally, if YOU are looking for a good book and want to see what the kids are reading, come in to visit our LA classroom- I love to recommend a good book! Math classes are off to a great start! Students are adjusting to homework counting towards their HOWLS grade. Their PowerSchool academic grade is based on both formative and summative assessments. Any opportunity in which they are independently demonstrating in class what they know is counted toward their academic grade. As a reminder, students have the opportunity to create a relearning plan with me and make test corrections for summative assessments. Every Monday there is a new “Math Challenge of the Week” problem written on the whiteboard in the classroom. Students may choose to complete the challenge problem and submit the response on Fridays! In Blue class, students began the year with a review of order of operations “Math Lib!” and the real number system pennant. Students have been working on chapter 1 exponents, learning all the exponent properties and how to evaluate square roots and cube roots. This week they have been preparing for their chapter 1 test! Next chapter will cover scientific notation. In Green and Yellow class, students began the year with a review of order of operations “Math Lib!”. Then they learned about the real number system and focused on irrational numbers. By the end of the unit, they were able to demonstrate how to put real numbers in ascending order and identify rational and irrational numbers on a pennant. Recently, students have been learning about all the properties of exponents. They will have a quiz on lessons 1.1 through 1.5 on Monday. To wrap up chapter 1, they will learn about square roots and cube roots. Students will then review chapter 1 to prepare for the chapter 1 test at the end of next week! It’s been great to see the 7th graders as 8th graders! Looping has provided many opportunities including reconnecting and jumping right in! We started the year analyzing what makes a good experiment and how we can incorporate those design elements for our own investigations. We were able to cite evidence and determine if the variable was independent (something purposely changed) or dependent (response to the independent variable). This will be useful as the students will be designing investigations and collecting data. ​We unveiled the miniboat at an assembly on Wednesday! For those of you who don’t know, I wrote a grant with the Clipper Foundation for the miniboat. The miniboat will sail the open waters of the Atlantic sending back GPS data for use to plot. Our guest speaker, Cassie Stymeist, described the program and delivered our boat. 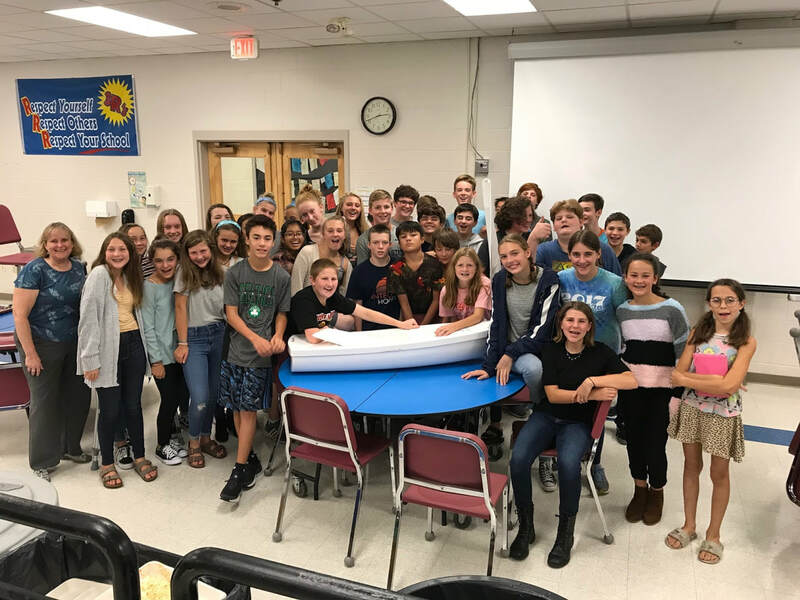 The 8th grade is charged with the task of finishing the construction of the boat. We will decorate it and then stow away some pieces in the hull that reflect our school. If someone finds the boat, they should be able to contact us and then relaunch the boat. For more information, you can visit educationalpassages.org. Once launched, our boat will have its own webpage. We have also been working on a robotics program called Hummingbird. Students are creating a display about one type of power that involves at least five robotic components. They are also keeping an Engineering Journal for this project. You are welcome to view their journals that are on their Google Drive. How does our global society get so divided that is escalates into large scale conflict? Why does conflict become so destructive? We started the semester investigating global conflicts related to the rise of the Industrial Revolution and how it led to war in Europe. We have been looking the US involvement in that war, and through analysis of primary source documents from the Lusitania and learning about the Zimmermann Telegram, the students have really answered how divisions can escalate, leading to conflict. After a brief look into a soldier’s life in the trenches, we will start to examine President Woodrow Wilson’s attempt to create “peace without victory”. Next up- maybe a 20 minute party to celebrate the amazing 1920s (covered extensively with Mrs. Harrington! ), then off to World War II, where we will look closely at government propaganda, the Holocaust, and the changing role of of the workplace for women and minorities in the US. Ms. Adams’ class has been investigating Progress in US history. We started with the definition of progress and discussed possible impacts of what we call progress. We made the connection of the telegraph and Rye! Did you know the underwater telegraph cable went from Rye to Nova Scotia, then Ireland? We examined how other inventions helped businesses progress, but not necessarily the lives of its workers. Primary source documents have provided evidence and we are learning to analyze the reliability of the documents.